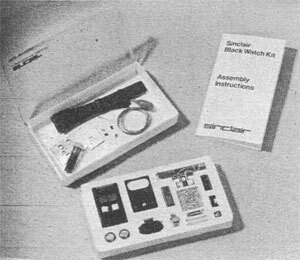 Exactly a decade before the C5 fiasco, Sinclair was nearly brought down by another disastrous product - the Black Watch, launched in September 1975 at £17.95 in kit form and £24.95 ready-built. Its name was uncharacteristically descriptive by Sinclair's usual standards - virtually every other Sinclair product had an arbitrary, often made-up name or jumble of letters and numbers attached to it. In fact, it is actually a pun; the original Black Watch was a famous Scottish army unit. 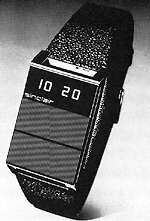 Sinclair's Black Watch was a unconventional-looking digital watch, moulded in black plastic with a five-digit LED display. Its most unusual feature was its lack of buttons or, indeed, a consistent display. To conserve power, the display defaulted to being turned off. Immediately below were two panels which turned on the display and allowed you to see hours and minutes or minutes and seconds, depending on which you pressed. The adverts rather obscurely described it as having "a touch and see case" with "no unprofessional buttons". It actually came in three versions, in grey as well as the nominal black, with the more sophisticated grey version also displaying the date. The chip could be ruined by static from your nylon shirt, nylon carpets or air-conditioned office. This problem also affected the production facility, leading to a large number of failures before the watches even left the factory. The result was that the display would freeze on one very bright digit, causing the batteries to overload (and occasionally explode). This fragility has meant that very few working Black Watches survive today. The accuracy of the quartz timing crystal was highly temperature-sensitive: the watch ran at different speeds in winter and summer. The control panels frequently malfunctioned, making it impossible to turn the display on or, alternatively, impossible to turn it off - which again led to exploding batteries. The kit was almost impossible for hobbyists to construct (and barely any easier for Sinclair's hard-pressed workforce). Practical Wireless advised readers to use two wooden clothes pegs, two drawing pins and a piece of insulated wire to work the batteries into position. You then had to spend another four days adjusting the trimmer to ensure that the watch was running at the right speed. The casing was very hard to keep in one piece. It was made from a plastic which turned out to be unglueable, so the parts were designed to clip together. The clips didn't work either and the problem was turned over to a subcontractor. Sinclair later (much later) received a small box on which was written, "We've solved the problem of the Black Watch!". Inside was a Black Watch with a half-inch bolt driven though it. The Black Watch's catalogue of problems led to a very high percentage being returned, leading to the legend that Sinclair actually had more returned than had been manufactured. The company had to go through the business of sending out tens of thousands of replacements, with no financial benefit whatsoever. Matters were made far worse by the perennial lack of a customer services department - only 20 people were available to repair and return all the faulty watches. The backlog eventually reached such monstrous proportions that it still hadn't been cleared two years later. The Black Watch fiasco had a devastating effect on Sinclair's finances: the company made a loss of £355,000 for 1975-6 on a turnover of £5.6m. The company would have gone bankrupt had not the Government, in the shape of the National Economic Board, stepped in to prop it up with subsidies and, eventually, direct management. Sinclair seems to have accepted state involvement only grudgingly and plainly did not enjoy the experience. In the 1980s, Margaret Thatcher's government - of which Sinclair was an ardent supporter and from which he gained his knighthood - abolished the NEB. Although Sinclair very probably approved of this on ideological grounds, the NEB's demise removed his safety net. The next time his company tottered under the strain of another disastrously botched product (in this case, the C5), Sinclair had no option but to sell it to an arch-rival, Amstrad.